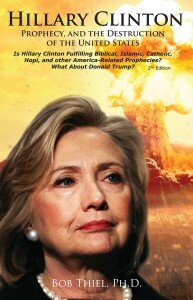 The second edition of my book, Hillary Clinton, Prophecy, and the Destruction of the United States, is now available at Amazon.com: Hillary Clinton, Prophecy, and the Destruction of the United States, 2nd edition: Is Hillary Clinton Fulfilling Biblical, Islamic,avai Catholic, Hopi, and other America-Related Prophecies? What About Donald Trump? The subtitle has been changed to include information about Republican Presidential candidate Donald Trump. Donald Trump was not mentioned in the first edition of the book as he did not announce his candidacy until about two months after that book came out. But Donald Trump was not the only reason to come out with a second edition. Hillary Clinton has made more statements that prove that my original contention that she is ‘apocalyptic’ is correct. Actually, the book Hillary Clinton, Prophecy, and the Destruction of the United States, 2nd edition: Is Hillary Clinton Fulfilling Biblical, Islamic, Catholic, Hopi, and other America-Related Prophecies? What About Donald Trump? lists 20 reasons why she is apocalyptic and also points out she, and even Donald Trump, are fulfilling certain end time prophecies. This edition is also a dozen pages longer than the first edition. But the point of this post is to tell everyone that I made arrangements with Amazon Kindle to give the Kindle version of the book FOR FREE. Amazon, however, only allows this for FIVE DAYS. And today is the first day. Hillary Clinton, Prophecy, and the Destruction of the United States-Amazon 2nd Kindle edition. Let me also add that YOU DO NOT HAVE TO HAVE A KINDLE READER TO READ IT. Amazon has an app link there so you can read it for free on many electronic devices. The app is also free. “Hillary Clinton, Prophecy, and the Destruction of the United States” explains about how, by virtue of her background and policies, Hillary Clinton is fulfilling, and will continue to help fulfill, various prophecies that will lead to the destruction of the United States. Not intended as an anti-Democratic nor pro-Republican book, “Hillary Clinton, Prophecy, and the Destruction of the United States” also tells the truth about Republican leaders like Donald Trump and why their practices would also lead to destruction. It answers many question. Is Hillary Clinton apocalyptic? Does Bible prophecy warn about a woman leading the USA? Could Hillary Clinton be the Antichrist? What really will happen to the USA and other lands? Citing Islamic, Buddhist, Catholic, Byzantine, Native American, and Bible prophecy, as well as the writings of Nostradamus and others, “Hillary Clinton, Prophecy, and the Destruction of the United States” explains from many sources where, why, when, and even some of how, the various aspects of destruction will come. Since Dr. Thiel first wrote about the Obama Administration in his 2009 book, it has taken steps to fulfill, at least partially, at least a dozen predictions that Dr. Thiel recorded. More will be fulfilled as well. Would you like to learn more about what Hillary Clinton has done and the real direction that the United States and its British-descended allies such as the United Kingdom, Canada, Australia, and New Zealand are really going? This highly referenced book documents the truth about this. Now, I will add that the Kindle version of this 200 page book has Kindle format issues. It has all the same information that is in the print version: Hillary Clinton, Prophecy, and the Destruction of the United States, 2nd edition: Is Hillary Clinton Fulfilling Biblical, Islamic, Catholic, Hopi, and other America-Related Prophecies? What About Donald Trump? However, how it handles paragraph and chapter breaks is not as good as the print edition. Anyway, the Kindle edition, Hillary Clinton, Prophecy, and the Destruction of the United States-Amazon 2nd Kindle edition, is free for five days. And no, Kindle will NOT pay me any kind of royalty for those who get the book free. But I thought I would make it available for readers who are interested in what prophecy indicates about Hillary Clinton, Donald Trump, the USA, the other Anglo-Saxon descended nations, as well as other parts of the world. Since Amazon Kindle will NOT allow the book to be free for more than the five days, you may wish to go to the link today before the free offer expires: Hillary Clinton, Prophecy, and the Destruction of the United States-Amazon 2nd Kindle edition. This entry was posted on Friday, June 10th, 2016 at 5:30 am	and is filed under COG News, Prophecy.